It might snow at the World Series in Philly tonight, and yet here in LA it's 90 degrees! WTF is up with that! If you live in NYC go to Kris' opening November 12 you guys! These are easily the best paintings of Lari Pittman's career so far, now on view at Gladstone Gallery. I could not get enough even after seeing the show twice. Giving credit where credit is due, Pittman show us his mastery of compositional and spatial devices accumulated over a four decade career. Excesses of pleasure and pain present themselves in Dangerous Pleasures: New Paintings and Sculpture, the work of Shimon Okshteyn at Stux Gallery. Hard and fast assumptions of gender codes blur in the works of Amy Elkins at Yancy Richardson. Taken out of the context of floral backdrops, these men are very masculine. Manly men you might say. Elkins successfully subdues the male bravado, not by simply placing floral patterns behind the men, but by also gently allowing the men to show us a vulnerability not always associated with men or masculinity. At the same time, Elkins assumes the role traditionally asserted by male painters (in this case Mattisse comes to mind) as we gaze through her eyes at these men, though for very different ends. Usually when looking at a representational painting people often say "wow, looks just like a photo". Well in the case of Sharon Core's show at Yancey Richardson, it's the opposite. While attending the opening I kept overhearing people say "wow! these are great paintings". It comes as no surprise that Core was once a painter, as I have never witnessed such painterly photographs. Trompe l'oiel redux, the paintings of Kirk Hayes at Sunday LES. At first glance the works look like collage on board. After careful examination, the paintings are made completely out of paint. From the wood grain to the pieces of tape, it's all made of paint. The Trompe l'oiel factor is more of a textural nature. The wood looks like it feels like wood, not just the illusion of wood. What looks to be slap-dash is really carefully-considered paintings. Belle du jour is the inaugural show at the Lower East Sides newest gallery addition Collette Blanchard Gallery. Belle du jour is a group show composed of all female artists working in a variaty of mediums and subjects. The show is co-curated by Collette Blanchard and Chrissy Crawford. Poetry and visual art converge in the work of Jud Bergeron at Sloan Fine Art. Bergeron uses the poetry of his best friend the late Bill Reynolds to create the pieces of his art. From there the form and medium of the art can vary from abstract sculpture, piles of letters on the floor, instolation and fuguration. Robert De Niro, Sr at Ameringer Yohe is a welcome surprise. The show is composed of paintings made in the summers of 1968 and 1970 while working in Provincetown or the Hamptons. Some how these paintings look like they were made yesterday and seem vital to what is going on with young painters today. Lisa Hamilton's show at Thrust Projects examines color and geometric form with luscious applications of paint. Early abstraction meets the 21st century with Logan Grider's show at Thiery Goldberg. 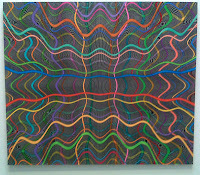 Jeff Elrod @ Leo Koenig INC.
Jeff Elrod displays abstract paintings which images derive from drawing on the computer to airbrushing direction on the canvas at Leo Koenig. 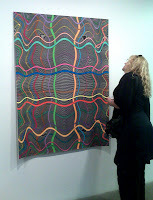 The meandering lines created on the computer are stenciled on a canvas and painted flat, creating a graphic quality that is then interupted and challanged by juxtaposing simmilar meandering lines air brushed on the canvas. Matthew Monahan's show at Anton Kern Gallery is very prolific, packed fill of sculptures and 2D works. I highly recommend stopping by to see this show to get a sense of scale and materials.